...that the UNSC Air Force and UNSC Army occupy UNSC territory as defensive forces? ...that the Koslovics were a neo-communist movement headed by Vladimir Koslov in the 2160s? ...that the Covenant battle station Unyielding Hierophant was repeatedly referred to as the "uneven elephant" by Avery Johnson? ...that someone bought the web address "ilovepees.com" hoping to get hits from I Love Bees fans incorrectly entering the web address? Fleet of Glory (around 50 vessels ranging in size from gunboats to corvettes. Georgi Baklanov and 3 of his people. All members of Papa-10 and Bartalan Craddog. "Investigative abstract: refer to operational document #ONIS3-33456-SO Retribution for full report on assassination of UNSC Admiral Graselyn Tuwa, associated abduction and murder of her husband and two dependents, and subsequent utilization of security unit Papa-10 in failed effort to recover antibodies and erase evidentiary links to rogue science officer Lieutenant Bartalan Craddog." — From an internal ONI intelligence finding detailing the events that launched Operation: RETRIBUTION and its outcome. Operation: RETRIBUTION was an Office of Naval Intelligence operation undertaken by Blue Team and the Ferret team lead by Veta Lopis in December of 2553. Lopis' team had been training at the Mill and elsewhere since its formation just months prior, but RETRIBUTION was the first true mission given to the joint Spartan and civilian unit. 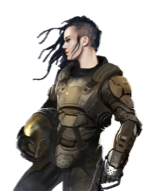 Veta Lopis and the two groups of Spartans were assisted by the crew of the UNSC Silent Joe, a Sahara-class prowler. The operation was conceived as a response to the murder of Vice Admiral Graselyn Tuwa and the kidnapping of three of her family members. The initial evidence pointed toward the Keepers of the One Freedom bearing the responsibility for this heinous crime, but the Keepers had actually been framed by Dark Moon Enterprises, itself being secretly directed by the Forerunner ancilla, Intrepid Eye. The Spartans' first objective was to discover the location of the base the missing Tuwas were likely being held at, and to do this, Lopis' team went undercover as pirates on Venezia. A feigned shootout with Blue Team enabled them to sell their cover stories and as a result, they were granted admission aboard a Kig-Yar vessel bound for the moon Taram. The four managed to survive a betrayal by their hosts and also escaped from a Keeper boarding party that met them at their destination. The bodies of the victims they were searching for were found eventually, where they had been planted by Dark Moon operatives still present on Taram. Blue Team inserted from the Silent Joe and helped aid the Ferrets in escaping a firefight with the Keepers, who captured a few survivors from the Dark Moon squad. Following forensic analysis of the corpses recovered, it became evident that someone had targeted the Tuwas based on a shared genetic mutation that had allowed them survive a deadly outbreak of protozoal disease years prior. The Silent Joe next made haste for Gao, where the Keepers had already struck the research facility where the Tuwas had been taken to and killed. 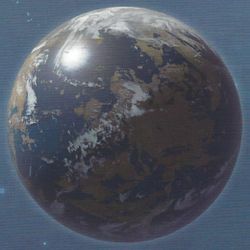 A conversation with the president of the Gao Republic, Arlo Casille, revealed that Administrator Sloan of Pinnacle Station on Meridian had approached him on behalf of Dark Moon in order to let the corporation use the lab. The UNSC teams arrived at Pinnacle Station just behind the Keepers once more and pursued both a group of them and a rogue ONI team to the surface. In the end, cryo-jars housing the Tuwas' organs were destroyed and everyone who might have been able to explain why they had been harvested were killed. Intrepid Eye's plans to use anti-asteroidea merozoite antibodies to create a vaccine that she would selectively expose only those she thought worthy to bear the Mantle of Responsibility to were foiled. Despite losing the Tuwas and their organs, Intrepid Eye's role in the events that precipitated Operation: RETRIBUTION went undiscovered and she was able to continue to direct the continuation of Project SLEEPING STAR, which entailed research of asteroidea onboard the ONI station Argent Moon. "So it wasn't just about killing the admiral. They came for the family--and it was important to take them alive." — Veta Lopis sifts through the evidence left behind on the Donoma. In 2538, there was an outbreak of disease at the Barugi Preparatory Academy. The illness was caused by the merozoites of a protozoal lifeform named asteroidea. It took only thirty hours for ten thousand people at the school to become infected. All but nine died shortly after. These nine were all partially resistant to being infected thanks to mutations they had that resulted in variants of thalassemia. Six with delta-beta thalassemia survived for years before finally succumbing to the asteroidea but those with gamma-thalessemia from a novel mutation did not suffer any adverse consequences whatsoever. These three survivors were Kerbasi Tuwa, the medical officer of the academy, and his two children, Catalin and Yuso. The devastation wrought by the infection caused the academy to be shut down and by 2541, the entire planet was placed under biohazard quarantine (BQ). Intrepid Eye allowed herself to be captured by Fred-104 within the caves beneath the Montero region. In May of 2553, a mysterious transmission from the Outer Colony of Gao drew the attention of the UNSC, and the Marine Corps' 717th Xeno-Materials Exploitation Battalion was dispatched to the planet to investigate. The battalion was escorted by Blue Team, comprised of eight Spartans at the time. The transmission had in fact been a request for a status report sent by Intrepid Eye, an ancient Forerunner ancilla that had been charged thousands of years ago with protecting the hidden Covert Support Base 4276. Intrepid Eye was awakened from stasis following the partial glassing of Shaps III, site of the line installation the base on Gao had supported. Before long, insurrectionist elements within the Gao Republic exploited the UNSC presence to stage a coup with assistance from the Venezia militia and the Keepers of the One Freedom. Ultimately, the Spartans managed to secure Intrepid Eye and exfiltrate from the planet. With them went Veta Lopis, a special inspector from the Gao Ministry of Protection who had aided them during the fighting. Lopis was offered a civilian position within the Office of Naval Intelligence and the chance to lead a new "Ferret" investigative team made up of herself and three Spartan-IIIs of the former Gamma Company which she had forged a bond with. Intrepid Eye was delivered to the recently-commissioned Argent Moon, an ONI research and development station, where she was kept under heavy guard to be interrogated and studied as part of Project Archeon. Despite the many limitations placed upon her, the archeon-class ancilla managed to covertly smuggle bits of code off of the station over a span of five months that resulted in the establishment of remote aspects of herself in five different sectors of human-held space. These aspects were used by her to establish and control propaganda outlets, private security contractors, law practices, and political consulting firms. During her detainment on Gao, Intrepid Eye had been convinced by another A.I. that humans were the intended Reclaimers the Forerunners had meant to inherit all their work. Since that revelation, it had become her primary purpose to make the species worthy of the great responsibility inherent in holding the Mantle. To this end, she began laying the groundwork through her multiple aspects for a series of events that she believed could bring humanity closer to this worthiness. One of her remote aspects presented itself to the dokab Castor of the Keepers of the One Freedom, who had nearly been killed on Gao. Eye had little trouble making him think he was being visited by a holy oracle with his best interests at heart, as she recommended a location for him to grow a new base for the Keepers and began to feed him information she had gathered concerning the routes and itineraries of human vessels. From the moon of Taram, Castor waged a campaign of piracy to rebuild his forces and had soon ascended to first among the Keepers' dokabs. It was her belief that Taram and the Suluhu Contemplarium on its surface would become known to humans eventually thanks to this, as she was concerned that telling them about it outright could compromise her plans. She hoped to keep track of those that would eventually visit the contemplarium and achieve a sufficient amount of spiritual enlightenment through it. 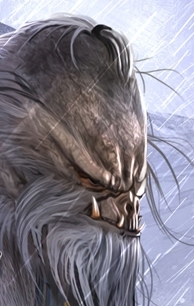 Onboard the Argent Moon, she also handpicked a young ONI lieutenant by the name of Bartalan Cradogg to serve her ends. Through the selective supply of information to he and nobody else assigned to Project Archeon, she ensured that he was promoted to higher importance than he rightfully deserved, and she also began to gather evidence of his sexual proclivities with which to blackmail him. On December 1, 2553 the UNSC passenger schooner Donoma came under attack while en route to the human colony of Nephis in the Tisiphone system. Onboard the ship was Vice Admiral Graselyn Tuwa, commander of the UNSC Navy's Isbanola sector patrol fleet. She had been traveling with her husband, her daughter, and her son to attend the Threshold Ceremony of the daughter of her sister, the Nephis premier. The strike was carried out at the behest of Dark Moon Enterprises, one of the security contractors controlled by Intrepid Eye. The ancilla's goal was to kidnap the survivors of the Barugi Incident so that the antibodies their bodies had made against asteroidea merozoite could be cultured and reproduced. Eventually, she intended to undertake a massive culling of the human species wherein only those deemed worthy would have been inoculated with a vaccine to the merozoites of asteroidea ahead of time. Dark Moon used a combination of Jiralhanae, Kig-Yar, and humans to hit the Donoma in order to frame the Keepers. Veta Lopis and her Ferret team were summoned to the schooner to investigate it by Read Admiral Serin Osman and based on their findings, they concluded that the Keepers did indeed seem to be the responsible party. Operation: RETRIBUTION was henceforth set into motion with the objectives of both rescuing the captured Tuwas and getting justice for Admiral Graselyn Tuwa, who had been brutally murdered during the assault. Veta Lopis: "The Spartans are coming for us and you think I'm stalling?" — Veta rebuffs the Goliath's suspicion. On December 12, 2553, Phase One of the operation saw Veta's Ferret team and the legendary team of Spartan-IIs, Blue Team, deployed to New Tyne, Venezia. ONI sources within the city had reported that a Keeper gunrunning crew was in port looking for cargo. In order trick these Keepers into approaching Veta's team, they would need to create a public scene that would pique their suspects' interests in them. For the past few days, the UNSC had been making a show of stopping and boarding Crows and specifically pretending to be on the lookout for one with Archer missiles or Mini-MACs. In addition, a story of the UNSC Taulanti being hit and having ten HAVOK nuclear weapons stolen was permitted to spread. These things were done so that the Ferrets could present themselves as the pirates who had raided the Taulanti. In order to really sell the idea that the UNSC was desperate to recover the nukes and that they had indeed been the ones to take them, the plan was for it to appear as if Veta and the Spartan-IIIs just barely escaped when Blue Team arrived. Venezia is home to all manner of pirates, salvagers, rebels, and others looking to get away from their respective governments. To this end, Veta's Spartans disguised themselves to look older than their actual ages and to look like street punks that fit the profile of those belonging to a pirate gang. They got a table at the Trattoria Georgi, where they knew a gunrunner known as "the Goliath" would be that evening. [note 2] Veta approached the Goliath, who was in fact Ross Nyeto, the son of a famous lieutenant commander that had defected from the UNSC Navy to take up the cause of the Insurrection. She revealed that she knew who he was to set him and his three men on edge and offered to pay for the transport of her crew aboard one of his Razor-class prowlers, the Ghost Flag. [note 3] Nyeto was resistant to her offer since he was not accustomed to transporting people as opposed to contraband and also had little interest in being paid in boson beads, which she had produced whilst stating her case. The beads did, however, provoke one of Nyeto's men to place a beefy hand over Veta's when she tried to gather them up off the gunrunners' table. Veta did not hesitate to use a pain-compliance technique on the man that caused all eyes in the restaurant to focus on them and for some patrons to nervously exit. Her Spartans also drew their sidearms at this time. The situation was diffused by the owner of the establishment, Georgi Baklanov, who assured his wary customers that the Goliath would be paying for everyone's tabs. Veta noticed two Ruuhtian Kig-Yar take their seats at a table closer to her than the one they had been at previously, and surmised from this that they could be affiliates of the Keepers and therefore the ones this whole show was for. Continuing her conversation with Nyeto, she casually let it be known to all within earshot that the reason her crew needed transportation was due to a problem with their S77 Crow, which also had been modified to sport Archer missiles and a mini-MAC. The Goliath put the pieces together immediately and changed his tune, now making an offer of his own wherein he would take them to their destination in exchange for ten of the Taulanti's nukes. Feeling that the narrative about who she and her team were had been effectively communicated, she signaled Blue Team to move into position by working a certain phrase into her talk with Nyeto. They would be breaching the trattoria in four minutes and it did not take long before lookouts paid by Baklanov spotted M121 Jackrabbits driven by Fred-104 and Kelly-087 turning onto Via Notoli. The place cleared out due to fear of the encroaching Spartans and threats from its owner. Among those that hurriedly left were the two suspicious Kig-Yar. Now all the Ferrets had to worry about was making their escape convincing. A deal was struck between Veta and the Goliath, who came up with the idea to have his Jiralhanae bodyguard, Picus, knock a hole in one of the exterior walls so that they wouldn't be flushed right through a doorway where an ONI sniper could be waiting for them. Things would have gone well enough had Baklanov interfered by making it clear that such an affront to his building would not be tolerated. He believed that he only needed to turn over these troublemakers to the Spartans to make them go away. He and his henchmen drew on Veta's team and though she convinced him he was in danger as well, it was too late. The delay made it so that her team was still present when Fred and Kelly crashed their Jackrabbits through the Georgi's front window and began a firefight. In the carefully-controlled engagement that resulted, Mark-G313 was hit in the shoulder and everyone but Veta, Ross, and the Spartans were killed, including Georgi Baklanov, who was shot by Kelly as a target of opportunity as soon as she rolled away from her vehicle. Picus did manage to create an exit before being taken out by Linda-058, who had been well aware that Veta and others weren't going to be coming out a door thanks to all the UNSC operatives being linked via an encrypted comm net. Nyeto glimpsed Linda briefly nodding at Veta before the Spartan-II knocked him out with a clean strike to the hinge of his jaw with her assault rifle. The Ferrets sprinted away from the wreckage of the restaurant, as Blue Team could only give them so much time before the need to make all this believable required that they pursue. Linda did fire a single shot at the fleeing "pirates" that tore into one of Olivia-G291's thighs before giving her full attention to securing Nyeto for transport to an ONI interrogation facility. Capturing the Goliath had not been a primary objective of the operation, but it was a bonus. A shallow-draft airboat had been left floating on the water beneath a trapdoor in a building ahead of the running Ferrets. The plan was for them to use it to escape through the swamp that this part of New Tyne had been built on. Before they could reach it, however, a tri-wheeled minivan driven by a Kig-Yar screeched to a halt in front of the Ferrets. The side door opened, and another Jackal told them to climb inside if they wanted to live. Fred-104: "Lopis can handle this, ma'am." Serin Osman: "You sound pretty sure of that. Why?" Fred-104: "Because she has a good team. The Kig-Yar will never have a chance to deploy that gas." — Fred and Osman during the discussion of whether or not to exfiltrate the Ferrets. Veta threw open the passenger's side door and climbed in and the Spartan-IIIs entered the back where two Kig-Yar were. The van sped away toward the New Tyne Airfield. The driver revealed herself to be Chur'R-Sarch, commander of her own starship. As the minivan approached Ziggy's Hangar at the airfield, Sarch told Veta she wanted the same deal that had been given to the Goliath: phase pearls in exchange for transportation. The Kig-Yar steered the van to the back corner of the hangar past several craft before arriving at a Mudoat starsloop, parking the vehicle in a parking bay within its cargo hold. Veta was still unsure whether these Kig-Yar were members or even associates of the Keepers of the One Freedom, but given that most Kig-Yar on Venezia had at least a casual relationship with the group, the chances were good. In order to keep up appearances, Veta urged that they hurry in leaving. She stated that she wished to be taken to Shamsa to meet the Banished there. Chur'R-Sarch bristled at this and said that by no means would she allow them to sell their HAVOKs to the Banished. To Veta, this reaction implied a sense of rivalry which all but confirmed to her that they were on the right track and this gang could lead them to the Keepers. Lopis adamantly maintained that they must be taken to Shamsa and threatened to find someone else who could accommodate her wishes. When it seemed to Sarch that the humans were about to walk right off the ship, she relented and said she could take them. It was obvious to Veta and Olivia, however, that Sarch had no such intentions and would probably double-cross them at the opportune moment. Even Veta's stipulation that she only pay half of what she would have to Nyeto for the Ghost Flag went unchallenged, which only made this conclusion more likely. Over two hours later, the Kig-Yar vessel still had yet to jump to slipspace. It had been necessary to retrieve the HAVOKs and bring them aboard after the deal was struck. Unknown to the Jackals, each of them was inoperable and one was in reality a disguised starship emergency locator beacon, or "slipbeacon". Once they arrived at a new destination, it would be able to transmit that location to the UNSC Silent Joe, the Sahara-class heavy prowler that had brought them to Venezia and which Blue Team was aboard. Around an hour after first arriving at Ziggy's hangar, spy gnats covertly placed by Ash-G099 transmitted a conversation between Chur'R-Sarch and her crew in the form of a microburst of data to the Silent Joe. Rear Admiral Osman, Blue Team, and the ship's captain and senior intelligence analyst were present to overhear the Kig-Yar planning to deliver their cargo straight to the Keepers and to murder their guests with ostanalus gas. Captain Piers Ewen believed they had no choice but to extract the Ferrets, which was seconded by Lieutenant Anki Hersh. Fred was confident in the team's abilities and believed they could handle themselves. Osman and the Spartan-IIs were the only ones that knew about the unique augmentations Mark, Ash, and Olivia had undergone that marked them as members of the SPARTAN-III program's Gamma Company. The decision was made to withhold from interfering due to Fred's confidence and a sense of owing it to Admiral Tuwa to take risks in order to see her family returned safely. The Ferret team smuggled four M7S submachine guns onto the Kig-Yar ship within the deactivated HAVOK devices. The Kig-Yar's starsloop, Stolen Faith, eventually departed Venezia for Pydoryn in the Shaps system. Having learned of the aliens' plan for them, the Ferrets devised a plan of their own. Before heading off to sleep, Mark secretly killed one crew member and switched out the ostanalus so that the dispersal of gas would be completely harmless. After it was released, the four humans played dead: Veta and Olivia in a sleeping compartment and Mark and Ash in the cargo hold, where they had been permitted to stay to guard the HAVOKs. All caught their would-be murderers by surprise. Veta and Olivia killed three Kig-Yar that came to check on them in their compartment and Mark and Ash did likewise to five more. Inside the casings of the inert nukes were four disassembled M7S SMGs and ammunition, which the Ferrets at this time put back together. With five Kig-Yar left aboard the ship to subdue, the females made for the flight deck where Chur'R-Sarch was sure to be while the boys went to put down any others. Veta and Olivia surprised one individual in the galley, who had no chance to defend himself whatsoever before three silenced rounds from Veta ended him. Sarch and a co-pilot were seated on the flight deck. The Chur'R was attempting to reason with Approach Control on the moon, Taram, evidently the location of the Keepers' Salvation Base. The human on the other end of the communication channel was nervous about the Kig-Yar's stated intention to "deliver" nuclear devices to Castor. After being told they would have to wait for a vigilance squad to inspect their vessel, Sarch tossed her headset away in frustration and turned to find herself face-to-face with the human females. Olivia dropped the copilot as soon as she reached for something, presumably a weapon, but Sarch made excuses for why they had not traveled to Shamsa and denied ever trying to gas them. Her defenses fell away quickly, however, and once she was told they had been playing her all along, she said it was regretful the ostanalus did not work. She was shot and killed while diving for her copilot's controls. "This decision is not for me. Someone who knows your science will inspect your devices; then we will take you to the Redoubt of the Faithful and advise our dokab whether to believe your story." — A Keeper Jirahanae chieftain to Veta Lopis. Olivia righted the ship, which had pitched forward during Chur'R-Sarch's death throes. Veta confirmed with Mark and Ash that all Kig-Yar aboard had been eliminated just as the Chur'R's abandoned headset began making noise. Veta grabbed it and covered the microphone as best she could. A Type-31 Seraph fighter and a Tronto boarding craft were headed their way. It became clear in that moment that hiding in the system until the Silent Joe arrived was not going to be an option. Mark and Ash both suggested that they take defensive measures and meet the approaching craft with force, but Veta shot that notion down, reminding them that they were supposed to be covert operatives. She was forced to admit to herself, however, that she simply was more concerned with their survival at that moment than with completing the mission. She declared to her team that they would be allowing the Tronto's boarders to enter, but she did tell Ash to gather the ostanalus he had stored in acetylene bottles and prepare it for quick dispersal through the starsloop's ventilation system in case things came to that. So that the Silent Joe would know which moon the Keepers were located on when it arrived in-system, Olivia loudly declared Taram to their target so the spy gnat attached to Sarch's corpse would broadcast it when the prowler arrived. Veta took her hand off of the mic and spoke to the voice on the other end, letting them know they were speaking to the Stolen Faith's new captain. To Veta's relief, the group of keepers in the Tronto came aboard using standard procedures and did not feel the need to use breaching charges. The first Jiralhanae that stepped out of the airlock was confronted by Veta alone, standing next to a pile of the starsloop's former masters. Naturally, seeing the corpses arrayed so caused him to train his Type-25 Spiker on her. The two were able to communicate through the Brute's use of a translation disk, so Veta raised her hands and promised she could explain. She also revealed that she was holding a detonator in her hand. Pressing the button would have released the ostanulus gas throughout the ship, which the Jiralhanae naturally figured must be linked to the HAVOK devices Chur'R-Sarch had mentioned. Veta went along with this line of reasoning, telling him that getting everyone blown up probably wouldn't be of great service to the True Path. He barked a command and three more Jiralhanae entered the ship to subsequently spread out and search for other humans, despite Veta's warnings against it. Each of the Spartans had taken a hidden position down one of three passageways that led away from the airlock and each soon had killed one of the Jiralhanae. The one in charge did not permit any further excursions down the hall, but did threaten Veta that she would not leave the system alive. At this, she countered with a threat of her own. She truthfully told him about the slipbeacon they carried with them, but instead of saying it had given their location to the Silent Joe, she told him that they had been in touch with the Banished, who would certainly come there if they did not receive the ordnance that had been promised to them. The Jiralhanae was racked with uncertainty then and decided the appropriate course of action would be to bring the humans to the chief dokab on Taram, Castor. He could evaluate them and their devices and determine whether they spoke truthfully. Relieved that she had bought more time and a possibly greater chance at discovering what happened to the Tuwas, Veta handed over the detonator, but not before transferring the ability to release the gas to a remote hidden within Ash's lowest shirt button. Veta attempted to use the threat of a conflict with the Banished to keep her team alive and free. Having ostensibly disarmed herself, the rest of the boarding party entered, consisting of six humans and two Kig-Yar. The Keepers took control of the craft and piloted it toward the moon while the Ferrets were herded into the galley unarmed and under guard. A young woman entered to inform the chieftain after the secretly-inactive nukes had been secured and sat down to speak with the four "pirates". The woman let them know she had discovered one of the devices was in fact the slipbeacon Veta had mentioned. Lopis reiterated what she had told the chieftain concerning their agreement with the Banished to see those nukes safely to them. The human Keeper told them that avoiding a feud with the Banished was certainly something she wished for, but she considered allowing the murderous group to be given thermonuclear weapons to be just as bad. She casually floated the idea that Veta's crew might be able to redeem themselves by helping to doing significant damage to the Banished. When Veta asked if she was offering to let them go if they complied, the woman clarified that they would never be free to go. They knew too much. If they would share the arming codes for the weapons, they would be allowed to live. That is, of course, she reminded them, unless Castor decided they were ONI spies and ruled otherwise. Veta shared the accurate codes and then, hooded and with their hands tied behind their backs, she and the Spartans were led down the boarding ramp to a spaceport within Salvation Base. Ash pretended to accidentally run into Olivia so that she could release the gas with the detonator in his shirt button. At the sound of canisters being blown within the ship, everyone sprang into action. Veta drove headfirst into the woman who had spoke with them. They both fell off the side of the ramp, with Veta landing on her shoulder. Veta headbutted her captor repeatedly in the temple until she was dead, while the three Spartans had little trouble breaking free of their restraints and dealing with the four other Keepers that had made it off the ship. Mark-G313: "We're going to need more firepower--a lot more." Veta Lopis: "Slow Down. First, we need a plan." Mark-G313: "We don't have time to start planning. I saw we find the Tuwas, grab them, and get out before the Keepers have a chance to react. Our plans have a way of going sideways lately." Veta Lopis: "Maybe. But sideways is always better than backwards--or dead." — Mark and Veta argue over how to proceed on Taram. Olivia freed Veta from her restraints with a knife, and the team looked around for the first time to assess their situation. Luckily for them, the starsloop had been set down in a quiet area. The nearest hub of activity seemed to be paying no attention to where they were. The spaceport lay within a giant crater. From their vantage point, the team members could see a fleet of ships being prepared to take off, which they reasoned must be due to the threat of the Banished being taken seriously. Mark and Olivia secured the bodies of the Keepers inside the ship by piling them on its boarding ramp and then closing it. While they did this, Veta policed the corpses' weapons and Ash kept watch. In addition to an assortment of small arms, chronometers, and a datapad, Veta also collected three comm headsets. Blue Team would not arrive for another five hours at the earliest, but simply hunkering down and waiting until then was not a viable option, since Castor would learn something had gone awry soon since he was expecting to receive prisoners. Locating the Tuwas was the first priority, and a nearby cliff face with artificial grottoes carved into it was determined to be a likely holding spot for them. Since they had been hostages themselves only a short time ago, it was reasonable to think that the starsloop would have been brought near a detention center. Veta gave a headset to Olivia and Ash, keeping the third for herself. With these they would be able to listen in on Keeper channels. The Turaco is an experimental reconaissance craft that had only begun being tested a couple of months prior to Operation: RETRIBUTION. Each Spartan went a separate way, with Veta trailing Mark toward the presumed detention facility. He walked as if his hands were bound while she pointed a Type-52 Mauler at his back. Ash, on the other hand, purposefully made a cut on his forearm and made his way toward the direction of the Keeper fleet half a kilometer away, purposefully trailing blood to make it look as if they had gone that way should anyone come looking for them soon enough. Olivia rewrote the Stolen Faith's security routines so she could seal it shut, then set her sights on an ONI REAP-X Turaco located just seventy meters from where they had landed. The plan was for her to commandeer the reconnaissance craft and have it ready to fly by the time the Tuwas were rescued. Mark and Veta passed the ship on their way to the cliff grottoes, and noted that it appeared to have only arrived recently. Additionally, Mark picked up a trail that had been left by whoever it had carried. Wherever one trod, pale ripples of shadow were left in the hard light surface that made up the ground of the clearly Forerunner ruin the Keepers had taken for their base. About a dozen paces from the entrance to the grotto Veta noticed that behind them, a lake of water had suddenly appeared so that the spacecraft were partially submerged beneath its waves. Before she could comment on the strange phenomenon to Mark, he disappeared within the mouth of the grotto and she found she could not communicate with him, even as Ash and Olivia responded to her hail. Unbeknownst to her, this was due to the fact that the installation had been designed by Forerunners to create a time differential between those within the Suluhu Contemplarium's grottoes and those without. The lake was largely an illusion only visible to those standing in relative proximity to the detention center, though some real water was also summoned around the subjects' feet to be convincing. Veta followed Mark inside the structure to find it devoid of any obvious occupants. They split up to ascend dual staircases. Both confirmed that the second floor was clear like the first to one another. Veta began to crawl back down the stairs to reconvene with Mark and noticed that someone else must have passed that way recently, as there was a trail of water that had been tracked by multiple individuals. Upon arriving where they had first entered, she was startled by a loud clanging as Mark tore into a weapons locker with his combat knife. Both he and Veta took took BR85 battle rifles with sound dampeners and sentinel sights. She mentioned the trail she had picked up and the pair followed it to an enormous chamber, where they came upon the corpses of Keeper guards that had evidently been executed and disposed of there. Reasoning that the killers must still be within, owing to the Turaco's presence outside, they cautiously retraced their steps up the stairs together with weapons at the ready. Meanwhile, Ash had also made his way to another location at the base of the grottoes after having steered far enough clear of the Stolen Faith. He was perplexed as Veta had been by the sudden lake which seemed to have appear from nowhere, but in his case he also had to contend with disappearing ships in the distance. Owing to the time differential, what seemed like brief moments to him were actually longer stretches of time beyond the locus of its effects, so the launching of the Keeper fleet looked instead like the vanishing of the fleet into thin air. Ash also sighted scaffolding surrounding the Stolen Faith that should have taken hours to construct and a breach that formed in its hull. In reality, it had. He was seeing the result of efforts that had not yet happened, if indeed his chronometer were to be believed. It told him that only fifteen minutes had passed since the team was divided, but it had actually been far longer than that. The illusory lake prevented him from seeing the mass of Keepers that had surrounded the ship. Ash could not take the time to appreciate what he was witnessing, however, as he had been pursued by a number of hostile Keepers which now moved to engage him from two directions as he knelt within the grotto's mouth. Having already killed eight pursuers, he readied himself for a final stand with his pilfered spike rifle and plasma pistol. A lone Jiralhanae spoke to him from beyond a corridor with an offer of peace conditional upon his surrender. This part of the contemplarium was supposed to impart a sense of tranquility upon its occupants, and this made violence difficult for those under its spell. Ash refused the offer. When Jiralhanae and Kig-Yar moved to intercept him, he turned their own weapons—a Type-2 spike grenade and M9 fragmentation grenade—against them. He shot the Brute's wrist and made it drop the primed spike grenade, then batted away the frag so that both ended up obliterating those that had attempted to use them. He didn't hesitate to finish off a Kig-Yar as it picked itself off the floor, and then faced another pair of Jiralhanae. He made short work of them with his spiker before deciding to abandon the complex and make for the Turaco where Olivia should have been, having finally dealt with all those that had been following him. After Olivia had arrived at the Turaco, she had used an ONI override code to gain entry. Within, she encountered a smart AI calling itself Argie, which was, unbeknownst to her, actually a remote aspect of Intrepid Eye herself. Argie contested Olivia's presence onboard the craft, but the A.I. did not give her up when a Kig-Yar inspection party had come sniffing around while Olivia hid inside an EVA suit. Olivia learned the Turaco belonged to Dark Moon Enterprises while searching for its name and transponder code. After over four hours had passed, she instructed Argie to put the Stolen Faith within view of one of its external cameras, but the construct refused to cooperate with even that simple request, even after being threatened with a complete system restore. Olivia manually followed through on her threat but even so, she knew the system resident AI would still be present once she turned the power back on. In that time without it, however, she peered out at the Keeper activity around the Mudoat starsloop and wondered about how she would proceed if much more time went by without her hearing from anyone else. Ash-G099: "Still here. But that's going to change when I'm back inside. There's a time differential ringing the spaceport." Olivia-G291: "Time differential? Like on Onyx?" Ash-G099: "I guess. It might even be a continuum warp. With as much artificial gravity as it takes to hold an atmosphere over the entire installation, that's a real possibility--especially since it's Forerunner tech." — Ash shares his theory after figuring out something is off about how time is passing relative to the detention center within the contemplarium. Shortly after reaching Pydoryn, Blue Team was ready to deploy to Taram in Silent Claw, an Owl insertion craft. Before it could leave, however, the team was recalled by Captain Ewen to the situation room. There, the Spartans were made aware of the big picture regarding the status of the operation. The Keepers' fleet had been visibly mobilized around Taram, indicating that the group was expecting trouble. In addition, recordings from the spy gnats within the Stolen Faith painted an unclear picture of what had happened after the Ferrets had been led off the ship. They indicated to those on the Silent Joe that the Keepers may have simply been preparing for the Banished assault they thought would be coming, but the sounds of gasping and wailing that followed the point at which the ship had landed were impossible to draw conclusions from. What had made the captain recall them just then, however, had been a microburst of data from just minutes ago. It confirmed that the Keepers had discovered the gnats, since they spoke of them and then presumably destroyed them. But more importantly, it confirmed Castor was present. Owing to his position as one of the Keepers' most important dokabs, Ewen was faced with a decision to make regarding the furtherance of the mission. There was nothing to suggest the Ferrets had accomplished their objectives or were even still alive, and if the Silent Joe pinged their TEAMCOM, it was likely that it would be giving away its position to every Keeper ship in the area. The best option left to them, Ewen thought, might have been to simply eliminate Salvation base with M947 Shiva-class nuclear missiles. All three Spartans of Blue team strongly opposed this idea, but Fred conceded that he understood the captain's perspective and signaled for Linda and Kelly to stand down. Preparations were made for a launch against the base, but the captain stopped just short of giving the final authorization. He made sure Fred understood that even if they could know any of their own were still alive down there, Blue Team wouldn't be deployed to the surface unless it furthered the goals of their mission. Once Fred stated that he was in agreement regarding that point, Ewen told Anki Hersh to signal the Ferret team. Olivia responded to their probe with a message wherein she informed them that she was alone within a captured Turaco and had been waiting for more than five hours to hear from the rest of her teammates. After the briefest mention of Argie, whom she named an "uncooperative AI", the message cut out since Argie had terminated the connection in response. In what little she had been able to verbalize, however, she had given enough to hint through precisely-chosen language that Dark Moon Enterprises might have been involved in what was happening. It didn't take long for the Keepers to get a bead on the Silent Joe's location following the communication and relocating became necessary. The contact with Olivia convinced Captain Ewen that sending in Blue Team was now justified, since he wanted to know if Dark Moon truly was involved and why. Recovering the Turaco also was added as a new mission objective. Meanwhile, after taking just six steps from the grotto mouth, the mysterious waves had vanished from Ash's sight. He also was suddenly faced with the large crowd of Keepers surrounding the Stolen Faith. To his further surprise, when he activated his microphone once more to contact his team, this time he was greeted with an acknowledgement from Olivia. She confirmed she was aboard the Turaco and told him that he wasn't going to believe who it belonged to. Ash figured she could pick him up from where he was, but Olivia let him know that Veta and Mark were still unaccounted for. Ash decided he would try to find them and that Olivia could then pick them all up at once, but Olivia let him know that he might not have to do that on his own, since Blue Team's arrival was imminent. This confused Ash, since he was still under the impression that only minutes had passed since the they had all gone their separate ways. He was unable to see how Olivia thought she could just hold her position for around five hours when a large crowd of agitated Keepers was already relatively nearby. Olivia, likewise, was puzzled by what had taken Ash so long and when he stated that it had only been around fifteen minutes, the pieces of the puzzle fell into place for him and he asked for the time from 'Livi. His suspicions were confirmed and he relayed his conclusion to her: a time differential evidently existed between the contemplarium's grottoes and the rest of it. Since finding the Inspector and Mark could take hours from the perspective of those on the outside, Ash turned and rushed back to it with haste in order to find them as soon as possible. Within the Suluhu Contemplarium's detention center, hours had passed without Veta's or Mark's knowledge. Inside, they had only been present for minutes from their perspective. As the two of them retraced their steps up the stairs once more, they took notice this time of signs the Turaco's crew had preceded them. Veta noticed mud tracked by boots that didn't seem to fit that found on Taram and so naturally collected a sample for later analysis. The sound of footfalls from the stairwell above them caused she and Mark to retreat down a hall on the second level, where they raced past six cells holding Sangheili and human prisoners. They managed to stay hidden as a team of four well-armed humans descended to the ground floor with a pair of half-empty rucksacks. Mark signaled for permission to engage them, but Veta adamantly refused. She believed that such an action could jeopardize their search for the Tuwas and also thought the squad might actually be UNSC. If they were hostile, then Olivia should have been able to handle herself if she had to. Resuming their search on the third level, they found more captives. All of these were human, and Veta could see by their dress that many had come from Gao. In one cell, three corpses were all that remained of Kerbasi, Catalin, and Yuso. Moving past their shock and disappointment, the two got into the cell by disabling the generator pod powering the energy barrier that sealed it off. Veta could tell right away that the Tuwas had not been killed at this location. By her estimation, they had been dead for between twelve and thirty-six hours. Even more strangely, internal organs had been removed from all three cadavers. Realizing it had been a mistake not to stop the Turaco squad, she grabbed Kerbasi's lifeless form and told Mark to get the other two. Dragging the bodies in tow, they made for the exit. — Lieutenant, Junior Grade Frederic-104 to Inspector Veta Lopis. Midway through the Silent Claw's stealthy insertion, Damon, a fifth-generation "dumb" A.I. riding in Fred's Mjolnir armor, intercepted a recall order that went out from Taram to the Keeper fleet. All vessels which had launched from Salvation Base had suddenly been commanded to inexplicably return. For Blue Team and the Owl's pilot, Ashveld, breaking comm silence to request an intelligence update from the Silent Joe would instantly alert the enemy to their presence. 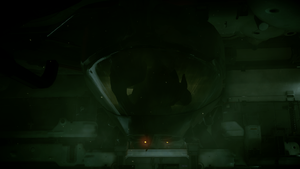 Though the Claw had already been detected in other ways, it was still outside of the visual range of any other ships and could pass itself off as one of them. In order to keep up this facade, Ashveld piloted them in as if they were part of the fleet. Plan Charlie had outlined that Blue Team would be inserted just over the horizon from Salvation Base and make its way there on M274 Mongooses. The prime objective was then to secure the Turaco and if possible, the team would attempt to reactivate the nukes still on the Stolen Faith with the required tritium boosters and wipe the Keepers' base from the moon. Their Owl was eventually recognized for what it was, however, and began to be shot at. Plan Charlie changed in an instant to plan Delta, as they would now be dropping from the craft under heavy fire. One particular hit sent the Claw spinning after it had already entered the atmosphere. Knowing the dropship was doomed, the Spartans begin launching themselves from the rear compartment when they were just under seventy meters from the ground. Fred followed last, from a height of fifty meters. While Blue Team had been rocketing toward them, Ash had raced to find Veta and Mark within the grottoes affected by the time differential. When he did find them dragging the bodies of the Tuwas near the point they had initially entered through, their chronometers told them it was still around 1524 hours, even though Olivia had told Ash it was 2035 hours only a short time ago. Ash took as little time as possible bringing his compatriots up to speed. They were shocked to hear that Blue Team could be there any minute, and when he mentioned Dark Moon Enterprises, the mysterious delivery squad finally made sense to Veta. She and the Spartans each grabbed hold of a Tuwa and began dragging them with haste away from the detention center. They emerged just as the Silent Claw careened into the ground in the distance, causing a fiery explosion which engulfed Ashveld. The sights and sounds of a battle became known to them as they left the tranquility of the contemplarium's illusions behind and rejoined reality. Blue Team was engaging the Keeper host that had piled around the Stolen Faith. Before exiting the Claw, Fred-104 had armed himself with a MA5D assault rifle and Kelly-087 had a MA5C with a M301 grenade launcher attachment, but Linda-058 held only a M6G magnum, since she had been unable to reach for her BR55 battle rifle in the midst of the tumultuous tailspin. The four individuals from Dark Moon had not yet reached their Turaco, as they had been contending with fire from the Keepers prior to the arrival of Blue Team. One of them had been injured and was being dragged along by two others. Just as the single female in the group was felled by a shot to the head, Mark asked for permission to engage the remaining three. Veta shot down his request, stating that they needed to find out what they knew and why they were here. To this end, she had Mark and Ash take shots at the humans' limbs in order to pacify them and halt their approach. Curiously, the dorsal turret on the Turaco started shooting laser pulses in its own crew's direction at the behest of Argie, who was fighting Olivia for control of the craft. Its output mirror had been damaged, so it didn't hit any of its targets before Mark put an end to it altogether. Realizing new combatants had joined, a mass of around thirty remaining Keepers (evenly divided between Jiralhanae, humans, and Kig-Yar) charged the Ferrets' position. This effort was short-lived thanks to the efficiency of the three Spartan-IIs still in the fray, which allowed Mark and Ash the chance to sprint for the Dark Moon operatives. Linda vanished into the Stolen Faith's hold to arm the HAVOK devices. Most of the surviving Keepers were fleeing, but Castor, Orsun, and two other Brutes took cover behind a pile of bodies near the Turaco. Kelly swiftly dispatched one of the cluster with a 40mm grenade but the other three managed to lay down enough suppressive fire to cover their own escape. Mark and Ash, unarmored as they were had to fall back from where the Dark Moon agents were to avoid being killed by them. Another blast from Kelly's grenade launcher took out another Brute, but Orsun still was able to stomp on the head of one of Dark Moon's people and scoop up the remaining two. It was only as he and the dokab were retreating that Veta realized one of them was Castor, who she had shot almost six months prior during the fighting on Gao. Lopis lined up a shot on Castor, but was hesitant to take it out of fear that she would hit the two men from Dark Moon. Fred saw this, and just as Castor was about to fire a barrage of superheated metallic spikes in her direction, he put a round through the dokab's weapon hand. By targeting the Brute's hand, there was no chance that he would hit the prisoners either. Veta fired at that moment but her shot went high thanks to Castor's sudden reaction to being hit with a 7.62×51mm FMJ-AP round. Nothing further could then be done, as the two were swallowed by a crowd of around twenty-four fellow Keepers that surrounded them as they all fell back. Seeing on his TACMAP that reinforcements were inbound from all around the site's perimeter, Fred confirmed that Olivia would be able to fly the Turaco and ordered the Ferrets to board it. Linda had only replaced the tritium booster cylinders in six of the nine HAVOKs, but Fred decided that would have to be enough. He told her to set the nukes to blow in just five minutes' time, but hearing this, Veta shouted that there were still prisoners inside the detention center. Retrieving them could take and hour or even longer due to the temporal divergence. Five minutes certainly wouldn't be enough. Veta wanted to protest, but with Keeper forces massing on all sides, she had to accept that there was nothing they could do for the captives. The thermonuclear detonation obliterated everything below the Turaco as it arced away from the moon to reconvene with the Silent Joe. Six Keeper vessels, attempting to get clear of the blast, had M947 Shiva nuclear missiles launched against them by the prowler. "It's Gao. The crime scene is on Gao." — Inspector Lopis comes to a realization concerning the Tuwas' murders. By 2557, ONI kept at least four individuals aboard the Argent Moon with delta-beta thalassemia that had been exposed to asteroidea merozoite and become severely deformed as a result. Veta and the Spartans were ordered to the infirmary for a full evaluation after stepping foot on the Silent Joe. Following that, they all were permitted to change into appropriate outfits for a debriefing with Captain Ewen in the ship's wardroom. In attendance were a smattering of other naval personnel as well as analysts, technicians, and others from the UNSC's Covert Services branch. Veta was angry with herself for having not considered doing anything to rescue the Keepers' prisoners until it had been too late. She surmised that Fred and the captain had engaged in a heated exchange concerning her last-minute protestations on Taram, and she was certain that Osman would have been informed. Veta was roused from her thoughts in the midst of the briefing by the captain, who had noticed she hadn't been paying attention to what the surgeon, Doctor Krosbi, had been saying. Reorienting herself, Veta said she agreed with his assessment that the Tuwas had only been killed within the last day or two. This meant that the murder scene had to be somewhere within that range from Taram, in terms of the time it would take to travel there. Unfortunately, Olivia had been unable to get a proper navigation history from the Turaco before Argie had erased herself and the nav logs with her. Having only the physical evidence to build a case around, Veta was able to determine that the Tuwas had been killed while lying on their backs, that their organs had been harvested soon after, and that they had already been dead by the time they were put on a ship for at least interplanetary travel. The cargo hold of the Turaco showed signs of having been used for just such a purpose, but the confirmatory DNA analysis had not yet been completed. The bodies were still in full rigor mortis and had evidently been left long enough to develop fixed lividity before accelerating during interstellar travel, so Lopis was able to narrow the list of potential kill sites to under fifty. It was the fact that they would have needed to be killed in a sterile environment to have had their organs harvested and still lack any insectoid colonization that made Veta conclude her home world, Gao, was the answer they were looking for. The planet boasted plenty of large pharmacology laboratories where the Tuwas could have been kept alive for weeks before their harvesting. It was Krosbi, then, that realized the perpetrators may have been trying to culture something before taking the organs. With Captain Ewen's permission, he recounted the details of the Barugi Incident and the protozoal lifeform that had caused it. He explained how the Tuwas had been protected by their shared gamma-thalassemia mutation when everyone else had been killed rapidly by the outbreak or made to suffer for an extended amount of time before also finally passing, in the case of those with the delta-beta thalassemia variant. Ewen was hesitant to authorize what he called a "fishing expedition" to a world hostile to the UNSC. He made a strong argument that an unprovoked raid on Gao could risk restarting the Insurrection in full, especially considering that they had no idea where to start among its thousands of labs. At this, Veta revealed the mud sample she had collected from the boots of the Dark Moon team. Hersh spoke up at this, saying that even without an astrogeologist aboard, a competent analysis of it could potentially be made by one of their materials technicians who was also an amateur mineralogist with access to the same botanical surveys that Gao bioprospectors used. Veta believed that she would be able to get help from one of her friends still present in the Gao Ministry of Protection so that Olivia could retrieve a database for comparison's sake that would place a target within a kilometer of the right location. Now convinced, Ewen agreed to the mission and designated Blue Team with the infiltration. He wished to keep the Ferret team aboard the ship owing to their injuries and Veta's recent reluctance to comply with mission objective priority, but he reluctantly agreed their inclusion would raise the odds of success. This was still an investigation, after all. He made it clear, however, that Fred was to be in command. Seeing as President Arlo Casille himself was now a suspect that might have tried to frame the Keepers on the Donoma for all they knew, the captain also verbalized that he was not to be eliminated under any circumstances absent an explicit order. "I'm telling you, Dark Moon has played us both. They set Gao up to take the blame." — Arlo Casille pleads ignorance when questioned by Veta Lopis. Veta Lopis was a GMoP special inspector prior to Arlo Casille's coup. Following her defection to the UNSC, Casille publicly declared she had died while fighting to drive its forces from the planet. The journey to Gao in the Cordoba system took the Silent Joe roughly sixteen hours. The prowler stayed hidden but Veta, the Spartans, and a Covert Services pilot by the name of Taj McAvoy made for the planet's surface in the Turaco taken from Taram. 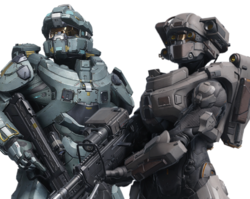 The Spartan-IIIs had now donned their semi-powered infiltration armor but Veta had chosen to go with a light battle dress uniform composed of little more than a ballistic vest. A false transponder code was used to placate the Gao Republic's Ministry of Aeronautics with full understanding that they would be receiving greater scrutiny once their tiny craft disappeared from the traffic control system without landing at any designated zones. Taj originally aimed for a landing pad in the Yosavi Jungle thanks to Olivia's comparative analysis, but changed course after thick smoke could be seen boiling from the remains of the New Leaf Extractions Field Complex from five kilometers away. There had evidently been some sort of attack within the last hour or two. Bodies were strewn about the complex and some had even been draped with sheets. Given the fact that the GMoP could be there to investigate at any moment, the teams wasted little time. The six Spartans established a secure perimeter while Veta studied a large crater the Turaco was hovering a meter above, which she discovered was actually made up of five craters. She was able to determine that the explosions that had created them had come from inside the building that had stood there just before McAvoy alerted her to a cluster of unknowns heading their direction. The individuals were bunched up in a group, which Veta took to mean they must have been civilians. Fred reluctantly permitted her to disembark the craft so it could vacate the scene in case of hostilities. Mark and Ash, hidden by the photoreactive panels of their SPI armor, flanked the eight people at the tree line's edge. One was armed with an 8mm Sevine Arms Defender but otherwise they carried pangas or kitchen cutlery. Veta slowly began making her way toward the group whilst giving her Gammas instructions on what to investigate. At this point, Kelly announced that she had found Jiralhanae tracks. Kig-Yar and human prints from what must have been ten attackers in total were also present. Though it now looked as if Dark Moon had intentionally framed the Keepers for what happened to the Donoma, signs pointed to this being an actual Keeper raid. The evidence indicated that Castor had learned about this location from the operatives he had gotten away with and had just managed to beat the Silent Joe there. Lopis handed Olivia her M6C/SOCOM suppressed automatic pistol. When he was just five meters away from the civilians, one of them, a stocky woman in her forties named Nita, called for her to halt. The group was made up of service workers who had worked at the field complex and had been assisting survivors of the raid get to safety before the Turaco had shown up. They were under the impression that the UNSC had sent the Keepers to strike them. Veta's accent betrayed her as a Gao native, and for that she was labeled a traitor by Nita. Keeping a cool head, Veta managed to talk the survivors into divulging a good amount of information about the operations at New Leaf, mainly by inventing an armored track-shovel she named "the M606" that they would supposedly need to dig out the lab, in addition to an imagined resolution referred to as "the Ganymede Accords" that she used to threaten Nita and the others with. She convinced them that if they did not share what they knew, she could have them arraigned as co-conspirators to an illegal bioweapon plot per the accords. Through these tactics she learned that for the past two weeks, the service crews had been banned from the laboratory itself. It was also shared that the Keepers had entered the lab during the attack seemingly intent on recovering something within and had taken the lab's director, Agnes Sabara, with them when they left. Veta pressed for information about the presence of any cryo-jars, and Miguel, the man with the SAD-8, revealed that they had been gone before the Keepers showed up. Nita corroborated this, saying that she had personally seen a Dark Moon team leave with cryo-jars the previous night. Kelly, speaking on TEAMCOM, asked if the situation might be developing into a Code HYDRA problem. Veta believed it could be. It was also now clear to her that President Casille must be involved in some fashion, but she wasn't convinced he was behind it all. She told Fred she wanted to question him. At the mention of the president's name, the eight civilians reacted in a way that Veta read as indicative of the fact that they wouldn't need to hunt down Casille, as he was actually coming to them right that minute. After confirming her intuition was correct, the civilians were secured to make sure they didn't cause any problems for the teams and Veta and the Spartans hastily put a trap into motion. Just under five kilometers remained along Yosavi Route 4 when a cyathea tree fern was felled to split up a convoy that was driving on the jungle track. The convoy had been led by a disaster-response Bronto and followed by a Roamer sandwiched front and back by two Murat gun trucks. The tree fern cut off the rest of the convoy from the Bronto, which continued to barrel on ahead once its driver realized they were under attack. A Spartan-III had no trouble subduing the lead Murat's gunner and taking over the 20mm Sawtooth chaingun. In a panic, the Roamer's driver put the vehicle in reverse but another tree fern dropped behind the aft Murat, cutting off an escape in both directions. Another Spartan-III took over the other Murat and both Fred and Linda handled their drivers. Kelly pacified the Roamer's driver and guard and Olivia pulled Duena Sandos, the Republic's Minister of the Environment, from the backseat. That left only President Casille himself, who was naturally surprised when Veta Lopis seated herself where Sandos had been a moment prior. She immediately began to question him about his role in the murders of Admiral Tuwa and her family, but Arlo denied any involvement. Through threatening him with incarceration at a fictitious "Borodyne facility", Veta eventually got Casille to admit that he had agreed to allow Dark Moon to use the lab on Gao. He adamantly maintained that he hadn't known about any bioweapons or their plans to target a UNSC admiral, however. He relayed that Dark Moon had promised to get the UNSC to handle his "Keeper problem" in exchange for the use of the facilities, in addition to other compensation they provided. He claimed that he had only learned two weeks ago that UNSC captives were being held on his planet. Lopis believed his story and pressed for further information concerning how they could find the ones responsible. To that end, Casille let her know that he had originally been introduced to Dark Moon Enterprises through the A.I. boss of Pinnacle Station on Meridian, Administrator Sloan. Veta Lopis: "Where are the Papa-10 survivors now?" Sloan: "Not on Pinnacle Station"
— Inspector Lopis is briefed by Administrator Sloan. Pinnacle Station, pictured here in 2558, was still being built at the end of 2553. Less than two days after the run-in with President Casille on Gao, the Silent Joe arrived at Meridian, a moon of Hestia V in the Hestia system. The Turaco was used to dock at Berthing Bay 12 on Pinnacle Station, an under-construction space elevator extending from the moon's surface. Veta and Olivia disembarked while the remainder of the Spartans waited in full armor for a signal to join them. It had been decided that the two would pose as UNSC security inspectors on a surprise construction review. Upon moving beyond the berthing bay, they noticed station security swarming around a Liang-Dortmund cargo transport that had evidently seen violence recently. They attempted to use their hastily forged credentials to gain access to its hold, but were initially rebuffed. Only after a supervisor cleared them for entry were they then given jumpsuits to be worn by visitors and allowed free reign of the station, including the transport in question. Inside, they found another Dark Moon Enterprises Turaco and dead bodies, whom they presumed had belonged to the couriers of the cryo-jars they were after. Following a path of carnage, emergency services personnel, and security officers led them to the True Light, a Laden-class freighter. Using thruster harnesses to maneuver in the microgravity, inside they found horribly mangled and burned bodies of Kig-Yar and Jiralhanae. Agnes Sabara was also floating amidst the alien corpses and while still clinging to life, she had been hurled against a hatch jam so hard that her torso had folded backward and she had sustained a dent to her skull that caused her to lose brain matter. Inspector Lopis let a guard positioned outside the freighter know about Director Sabara, but he told her that neither he not any other Pinnacle Station personnel were interested in helping anyone but their own. He clicked his mic off to tell Veta plainly that her cover wasn't fooling anyone. He said he knew they were ONI and that they could clean up their own messes. Veta replied that she would still like to be able to interrogate the woman, but at that moment they were interrupted by the voice of Administrator Sloan, which boomed from the guard's helmet and from deep within the True Light. Sloan offered to tell Veta everything he knew about the current situation. She instructed the guard to kill anyone that followed them aboard, signaled Fred to be ready, and made for the freighter's flight deck. There, a holographic projection of Sloan stood upon a holoplinth. Veta began with an attempt at blackmail thanks to what she knew about his creation, but he let her knew that was unnecessary and that he was intending to be fully cooperative. He mentioned that he had honored their arrangement and that an ONI unit called Papa-10 had hit the Dark Moon couriers, which caught Veta by surprise. She covered for her lack of understanding by claiming to have simply been trailing the Keepers when a call came in for the services of a relief team being needed. He claimed that the Dark Moon operatives had paid for a hidden berth which he had provided, knowing that ONI would then be taking possession of the jars. He had not expected the couriers to be executed or for the Keepers of the One Freedom to show up, however. He said that last he knew, there were three survivors from Papa-10 that had gone to the surface with the jars and that four Keepers were chasing after them. Meridian was glassed by the Covenant in 2551, leaving sites such as tantalite mines abandoned. Veta and Olivia returned to the Turaco and before long Taj was piloting it through Meridian's atmosphere in hot pursuit of Papa-10 and the Keepers. All Spartans and Veta were now fully armed and armored. Fred cautioned Veta against her direct participation in their mission's next stage but was rebuffed. The Silent Joe had been informed regarding the latest developments and to the teams' surprise, Captain Ewen broke comm silence to order them via microburst to provide combat support to the ONI survivors. The Turaco's atmospheric entry caused an ionization blackout which allowed Veta to speak freely without having to worry about anyone on the prowler listening, so she took the opportunity to express her suspicion concerning Papa-10. The others agreed that something was off, but Fred reminded them that Osman might be working an angle unknown to them and that their orders did not involve capturing fellow naval operatives. He ultimately decided that they would give whatever support they could to Papa-10, but that the cryo-jars would be taken from their possession until someone with more authority could decide what to do with them. Once the landing zone atop a mountain terrace was less than a kilometer below them, two personnel shuttles could be seen. One still had a number of workers from Pinnacle Station aboard, but there were no signs of hostilities. Taj had been expecting a hot drop, and the lack of any immediate danger made him nervous. He took a sheltered approach around the mountain and dropped everyone off quickly. Footprints showed humans pursued by Jiralhanae into one of two adits that ended at a cliff face where they were. Blue Team entered first, followed by the near-invisible Gammas in a five-second staggered formation. Just before Ash was to bring up the rear behind Olivia and in front of Veta, he noticed what appeared to be a map. It showed an extensive network of underground passageways they were once part of the Jenny Lynn Tantalite Mine. Veta got permission from Fred for she and Ash to use their hand-lamps to illuminate it. The details were transmitted to Veta's TACMAP and shared with everyone else via TEAMCOM. Damon analyzed it and concluded there were ninety-seven kilometers of mapped passageways within the mine. "Take cover! Papa-10 hostile. Repeat--"
— Veta's warning is cut off by the blasts from gelignite grenades. Since taking work for ONI, Inspector Veta Lopis has been gifted her own suit of semi-powered infiltration armor. About a hundred paces into the adit the teams came upon a charging station stocked with vehicles used for mining. A JOTUN Arilus and a Traxus powder wagon both bore tires that had been recently slashed, and someone had evidently taken laser drills from the Arilus' drilling jumbo. The powder wagon's loading hatch had been jimmied, which indicated to Veta and the Spartans that Papa-10 had been looking for explosives. Newly-made tire tracks from a missing vehicle also led away from an empty equipment bay deeper into the adit. The map of the mine Veta had acquired showed that there should be a explosives storage magazine about two-hundred meters further ahead of them. At that moment, however, she and the others were suddenly thrown off their feet by a powerful pressure wave. The blast knocked out Ash's HUD, disabled Olivia's mic, and rendered the photoreactive panels on Mark's SPI armor incapable of camouflaging him. Fred, Kelly, and Linda confirmed in rapid succession that no hostile contacts were immediately present and Damon suggested that a gelignite packet had been made into a makeshift grenade. And explosions within the confines of the mine's narrow passageways would naturally result in very focused pressure waves like the one that had just struck them all. 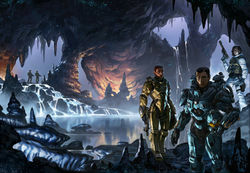 Mark and Ash joined the Spartan-IIs in pursuing the source of the blast while Veta and Olivia hung back somewhat to provide counter-ambush cover. Olivia occasionally made sure diverting passages were clear as they moved forward, beginning with an access tunnel leading to Adit 1 on their left and then continuing with multiple stopes that had been dug to a large cavern where the ore body had once been extracted by the mining operation. Veta eventually joined her in this endeavor, as the two took turns clearing the many stopes before continuing behind the others. At last, the teams came upon both survivors of Papa-10 and their Jiralhanae pursuers, who had cornered the humans at the site of a cave-in. Both sides appeared to be out of ammo, as the Brutes were chucking rocks at the humans who were defending themselves with laser drills. Blue Team moved to eliminate the Jiralhanae while Mark and Ash went to relieve and resupply the other ONI team. The Jiralhanae realized what was happening as soon as the Spartans began to fire. Fred was struck in his helmet by a large boulder hurled at him by Castor, who had been hidden within the darkness of a stope Fred had been trying to clear. The Papa-10 operatives took this opportunity to make a move of their own as well. The massive ten-ton load, haul, dump machine the three had hijacked lurched forward and ran right over the MJOLNIR-clad Spartan without a second thought given by its operators for him. Olivia managed to hit the dokab with a few shots as he jumped onto the back of the vehicle. Veta spied one of the two men in the LHD's loading bucket preparing a gelignite grenade, but still gave them the benefit of the doubt, as she could also see that Olivia was shooting at someone else. Lopis switched off her SPI armor's active camouflage and ran into the path of the oncoming LHD in the hopes that she could signal its driver to stop. When instead she accelerated and raised its loader bucket to shield herself from attack, Veta instantly knew that Papa-10 was not friendly. She could do nothing else to save herself from the LHD barreling down on her but to throw herself prone in the center of the adit. The LHD passed overtop of her harmlessly, but not before she grabbed a cross member on its underside with both hands to be yanked along for the ride. Improvised gelignite grenades were used to cover the LHD's escape as Fred wearily recovered from being run over. He had sustained injuries to his right collarbone, ribs, and arm but had received a biofoam injection from his armor. The armor itself had lost all energy shielding capabilities, was not allowing Damon to reboot, had nonfunctional reactive circuits, excess pressure bleeding from the hydrostatic gel layer, and had suffered the loss of the cooling system for its compact fusion reactor. An injured Jiralhanae was attempting to drag him into a stop to finish him off with a rock, but Fred overcame the gel layer's pressure to fight back by headbutting the Brute, as his assault rifle had been crushed and reaching across his body for an M6C magnum that was likely clogged with mud would have alerted his enemy to what he was doing. The Keeper still managed to smash the rock over the Spartan's head, but two well-placed kicks allowed Kelly to land a line of shots from her MA5K that killed the alien. Fred warned her concerning the imminent overheating of his armor's reactor so that she proceeded to help him shut it down. Castor is one of the Keepers of the One Freedom's leading dokabs. Following Operation: RETRIBUTION, he was left alone and injured but alive on Meridian's surface. The other Spartans confirmed that three of the four Keepers had been killed but that the one that surprised Fred had seemingly gotten away. Veta's hitching of a ride on the underside of the LHD had also gone unnoticed, so her status was unknown to them. Meanwhile, the LHD was being driven deeper into the mine. Its driver had taken two sharp left turns so that it now was within Adit 1. As Veta clung to its belly, she tried to transmit an update to her squadmates, but the attempt was in vain, given the extensive amounts of rock between they and her. She had spied Castor's foot hanging off the back of the LHD, but after it disappeared she began to painstakingly climb backwards toward the vehicle's rear. Through letting her SPI-clad feet drag for a but on the ground, Veta managed to flip over and hoist herself onto the back. She quickly climbed into the bed of an ore box to keep herself from flying off of the speeding machine. Within, she spied three cryo-jars and the wounded dokab, though he did not see her. His attention was on the other humans and it wasn't long before he had waited long enough to spring his attack. Despite his injuries, he crawled out of the box and into the loading bucket occupied by the two with laser drills. Veta rushed to pack C-12 around the jars so that she could destroy them if necessary while Castor battled the others. The LHD hit a corner, which sent one of the operatives flying out of the bucket to be crushed under the LHD's tires. Castor appropriated the dead man's drill but could not dispatch the other with it before the driver tipped them both back into the ore box where Veta was. Castor got his kill anyways, slicing the man in half. Lopis remained as still as she could, but the mud on her armor made her presence obvious to the Jiralhanae in spite of her active camouflage. Realizing she couldn't hide, she chose to deactivate the camo and drew her mud-caked inoperable magnum on Castor in the hopes that he couldn't tell it wouldn't fire. As they fast approached the mine's exit, Veta motioned to Castor to jump out, having fully resolved at this point to destroy the jars and the organs within them. Castor did not take seem to kindly to her signal of a truce in light of their common enemy, but as he raised the drill a support beam caught him on the back of his head. As the LHD careened into open air and landed to race across the mine's tailings basin, its driver intentionally trying to shake off her uninvited passengers, Castor was tossed from the vehicle. Veta soon followed by her own design, abandoning the machine for the safety of firm ground beneath her feet. The LHD slowed to a stop next to a Pinnacle Station utility skiff. Bartalan Craddog descended its ramp and pointed the LHD's driver to pay attention to Veta behind them. The driver snatched Craddog's assult rifle and aimed it at her, but Veta detonated the C-12 at that moment. The LHD, the two humans, the skiff, and the cryo jars were all torn asunder and engulfed in a fiery explosion. Rooker: "You can't do that! You don't have authorization!" Intrepid Eye: "To do what? I was merely inspecting the routing instructions. This finding seems to have come to the wrong place." — Intrepid Eye begins to outmaneuver Rooker after being caught by the other A.I. The Spartans eventually caught up to Veta and the burning wreckage she had created, the threat posed by the asteroidea apparently now gone. Unbeknownst to any of them, she had also inadvertently destroyed Oriel, a remote aspect of Intrepid Eye that had been directing Papa-10's actions on Meridian through Lieutenant Craddog. Fred gave her a small amount of pushback regarding her decision to neutralize the Papa-10 operatives and two others from the utility skiff, in addition to destroying the cryo-jars, but she defended her actions by appealing to self-preservation. Fred relented without any further argument after hearing how she had almost been fired upon by the driver of the LHD. Kelly and Linda secured a landing zone for Taj, who flew the Turaco to pick them up in an expedient manner. Hidden within the Crow's Eye Nebula, work with asteroidea on Argent Moon continued according to the puppeteering of Intrepid Eye. Left behind on the moon's surface was Castor, who had trouble understanding why Veta had let him live. Injured and without a working translation disk, he set off across the glasslands in the hopes that he could somehow persuade some humans to assist him offworld. The next day, the Silent Joe rendezvoused with another ship in deep space in the Geryon sector. According to Admiral Osman, the Ferrets were needed back at the Mill as soon as possible to complete their training. She let Veta know that something big was coming and that she needed them ready for it. Before departing, Lopis said goodbye to Fred, who was recovering in the prowler's medical bay. His wounds would heal soon enough, but Damon's status was less certain, as the A.I. 's data crystal had been cracked during the violence done to the Spartan hosting it. When an internal investigation was done within ONI, the evidence pointed to Craddog having acted alone to weaponize asteroidea. He was judged to have been a brilliant yet unstable individual who may have been seeking to initiate Project SLEEPING STAR under his own authority. The only sufficient conclusion for his motivation was that he had sought to aggrandize himself through creating such a perilous weapon. Craddog's complete file was forwarded to Section Two for further evaluation. Blue Team, Lopis' Ferret team, and the crew of the Silent Joe all recieved congratulations and notes of commendation for their part in exposing and stopping SLEEPING STAR. Veta herself was awarded a Military Star in recognition of her leadership in defeating an existential danger to humanity, but she was not made aware of the award due to her civilian status. Admiral Osman completed a directive on January 19, 2554 that officially abolished Project: SLEEPING STAR. Intrepid Eye deemed asteroidea to be too effective of a culling agent for her plans to plan to make humanity worth of the Mantle, however. She secretly altered the directive so that instead of being outright ended, the project was made into a Top Secret Level Zero asset and placed on a black-ops list with an unlimited black budget. When Blue Team boarded Argent Moon in 2558, it came upon the infected corpses of Kig-Yar test subjects. Instead of being terminated with prejudice, Ensigns Jess Wallace and Kris Gaston were also promoted through Intrepid Eye's manipulation to Lieutenant Commanders and were given authorization to seek out new donor specimens with asteroidea antibodies. 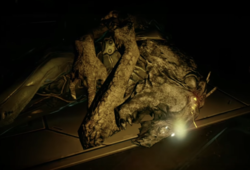 In addition, they were given authorization to test the weaponized form of the organism on all "enemy species" of the UNSC. In the midst of making these changes, Intrepid Eye was accosted by Rooker, Argent Moon's shipboard A.I. He was no match for the archeon-class ancilla, who easily used a control worm, a deception routine, a logic trap, and a memory leech to make him passively deliver the altered directive to Admiral Friedel without any recollection of ever catching her in the act. Project SLEEPING STAR moved forward unimpeded from that point aboard the Argent Moon. By 2557, at least four humans with delta-beta thalassemia that had been exposed to asteroidea merozoite had been brought aboard the Argent Moon. They had become severely deformed as a result of their prolonged infection and were kept within large tanks within one of the station's laboratories. Kig-Yar prisoners were also being actively experimented on with asteroidea. On March 3 of that year, an accident caused the protist to be unintentionally released throughout the Argent Moon via its ventilation system, killing everyone aboard by March 17. Rooker broadcast a message warning of the disaster and put the station on a course that would keep it away from all inhabited systems. By June, ONI had discovered Intrepid Eye's machinations and the mistakes made in dealing with the ancilla had been learned from. 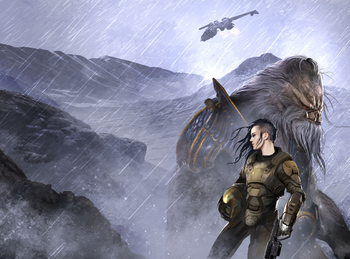 Kig-Yar scavengers chanced across the Argent Moon in October of 2558 and sold their find to Jul 'Mdama. One week later, Blue Team was deployed to recover the station for ONI but ended up overloading its reactor and destroying it instead due to the size of the Covenant occupation present. Due to the top secret nature of SLEEPING STAR, UNSC investigators who examined the remains of Argent Moon remained unaware of the scope of the project, though they did discover that bioweapons had apparently been manufactured there. 1122 hours: Veta Lopis and her team board the Donoma to investigate the attack on it. 1432 hours: Veta approaches Ross Nyeto at the Trattoria Georgi. 1504 hours: The Ferrets reach the New Tyne Airfield with Chur'R-Sarch and two other Kig-Yar. 1613 hours: Spy gnats planted by Ash-G099 transmit a randomly-timed microburst of data containing a conversation between Chur'R-Sarch and her crew. 1714 hours: Blue Team boards the Silent Joe after concluding its activity on Venezia. 0800 hours: The Stolen Faith emerges from slipspace at Pydoryn around this time. 0804 hours: Crew members of the Stolen Faith come to check on Veta and Olivia, believing they are dead. 0824 hours: Keepers board the Stolen Faith via a Tronto. 1445 hours: The Ferrets are escorted off of the Stolen Faith at Salvation Base. 1447 hours: Having killed their captors, the Ferrets make plans for what to do next. 1454 hours: The Ferret team splits up to accomplish different objectives. 1509 hours: Ash-G099 kills a group of Keepers within the Suluhu Contemplarium. 1514 hours: Veta and Mark discover captives held within the grottoes of the contemplarium. 1524 hours: Ash reconvenes with Veta and Mark, after having previously established contact with Olivia at 2035 hours outside of it, thanks to the time differential. 2005 hours: Olivia powers down the Dark Moon Enterprises team's Turaco for a system restore. 2015 hours: The earliest point at which the Silent Joe could have arrived at Pydoryn. 2020 hours: A microburst of data from a spy gnat is transmitted to the Silent Joe with audio recordings of Keepers at the Stolen Faith. 2027 hours: Blue Team enters the situation room aboard the Silent Joe to convene with Captain Ewen. 2029 hours: Castor confirms that ONI had slipped a tracking device onto Salvation Base. 2032 hours: The Silent Claw rockets toward Taram with Blue Team aboard. 2035 hours: Ash establishes contact with Olivia after emerging from the Suluhu Contemplarium's detention center. From his perspective, only around fifteen minutes had passed since the team split up. 2117 hours: The Ferret team and Blue Team are debriefed within a wardroom on the Silent Joe. 1403 hours: Blue Team and Veta Lopis' Ferret team are dropped off at the New Leaf Extractions Field Complex in Gao's Yosavi Diversity Reserve. 0327 hours: A battle between the Keepers and Papa-10 erupts. Three Papa-10 operatives, led by Bhu Zdenyk, flee with the cryo-jars. 0349 hours: Veta and Olivia board the True Light to investigate recent violence between the Keepers, Papa-10, and the Pinnacle Station Security Force. 0354 hours: Taj McAvoy flies the captured Turaco through Meridian's atmosphere to insert Blue Team and the Ferrets. 0401 hours: Blue Team and the Ferrets stop to investigate a charging station within the Jenny Lynn Tantalite Mine. 0421 hours: Fred-104 fends off a Jiralhanae attempting to kill him after being run over by an LHD. 0422 hours: Veta realizes she is not the only stowaway on Papa-10's LHD. 0433 hours: Veta detonates the C-12 she packed around the cryo-jars, destroying them and killing both Bartalan Craddog and Bhu Zdenyk. 0448 hours: The Spartans are reunited with Veta outside the Jenny Lynn Tantalite Mine. 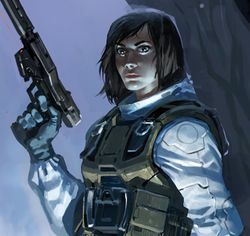 "Halo: Retribution details maverick detective Veta Lopis' first assignment as a reluctant ONI agent, and it's a direct outgrowth of my first Halo novel, Halo: Last Light." 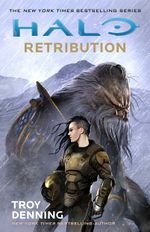 Operation: RETRIBUTION was created for Halo author Troy Denning's second full-length novel in the series, Halo: Retribution, in which its events form the narrative of the story. By the time he was drafting the final chapter of his first Halo novel, Halo: Last Light, Denning knew he wanted to write more stories about Veta Lopis and the Spartan-IIIs she'd met on Gao. He came up with the idea of a "Ferret" team based on that relationship; that of a wary, embittered homicide investigator whose maternal instinct was unexpectedly awakened by a trio of battle-hardened Spartan-IIIs working their way through a very strange adolescence. It seemed natural to him to make his next book about that team's first mission. Halo 5: Guardians, the fifth numbered video game in the series, was released on October 27, 2015, just over a month after Last Light was published. It was while playing through Halo 5: Guardians' campaign that Denning realized he wanted to know more about the backgrounds of Governor Sloan and Argent Moon. After asking individuals at 343 Industries about them both, he learned that their backstories were in fact relatively undeveloped, so he began formulating a way to tie them into a story involving Veta's team. When a second novel starring Lopis had first been approved, all 343 Industries requested is that it be set in 2553 and include Arlo Casille, Castor, and Intrepid Eye, three characters introduced in Last Light. Other suggestions were also made, especially relating to details relevant to the story in Guardians. ↑ This image is a pictorial representation of the portion of the operation that took place on Meridian but does not indicate there was a moment in time during which Veta and Castor were not hostile to one another. Such an occasion never arose. ↑ Though the time at which Veta approached Nyeto was only a little after 1430 hours MST, it was evening in New Tyne at that time. ↑ Hector Nyeto and his theft of the Prowlers, including the Ghost Flag, happened during Operation: SILENT STORM in 2526 as seen in Halo: Silent Storm. ↑ The prowler pictured here is the UNSC Aladdin, not the Silent Joe. ↑ Fred and Linda were armed with an MA5D assault rifle and an M6G magnum during the skirmish on Taram, not the M395 DMR and SRS99-S5 AM sniper rifle pictured here.